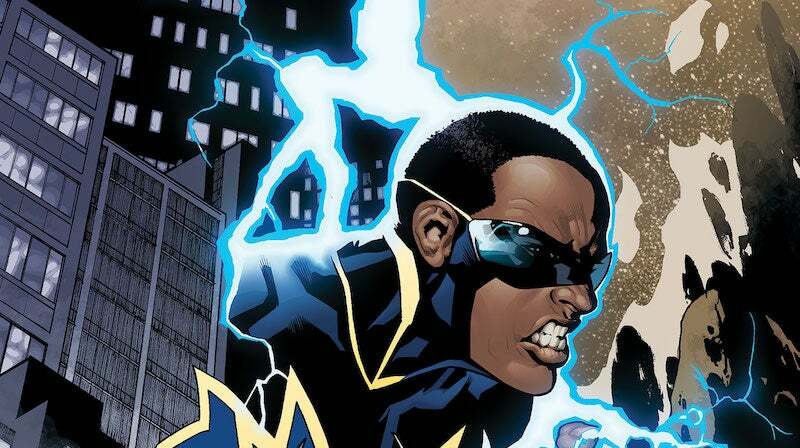 Lest you think Greg Berlanti was done making superhero shows after Arrow, The Flash, Legends of Tomorrow and Supergirl, the man's working with Mara Brock Akil (The Game and Being Mary Jane) and Salim Akil to bring Black Lightning to TV. According to Deadline, the show is being produced by Warner Bros. TV and written by the Akils. All are currently in the process of trying to sell the show to a network. The natural home for the show would be the CW, but CW president Mark Pedowitz just said a few weeks ago that the channel was in "no real discussions about any more superhero characters". Deadline also reports that Black Lightning's been in the pipeline at Warner Bros. TV for more than a year, which makes it hard to believe that Pedowitz didn't know it was an option when he said that. Black Lightning is a DC character created by writer Tony Isabella and artist Trevor Von Eeden in the 1970s, an African-American superhero with the power to generate and manipulate electricity (originally with a belt, but he's a metahuman now). His real name is Jefferson Pierce and he has two superhero daughters. My favourite fact because it's just such a perfect embodiment of comic books: Pierce was the Secretary of Education when Lex Luthor was the President of the United States. I really would love to see that plot on television.